From the outset, showed France similar problems as in the first game. Already there they concentrated too heavily on securing their own possession without really trying to overplay any players. If one considers the formation of Albania that the defensive somewhere between 5: 4: 1 and 6: 3: 1 commuted, the freewheeling movement of France’s midfield and attack made simply no sense. Already from the formations of France and Albania there was a majority of France players in the build-up. 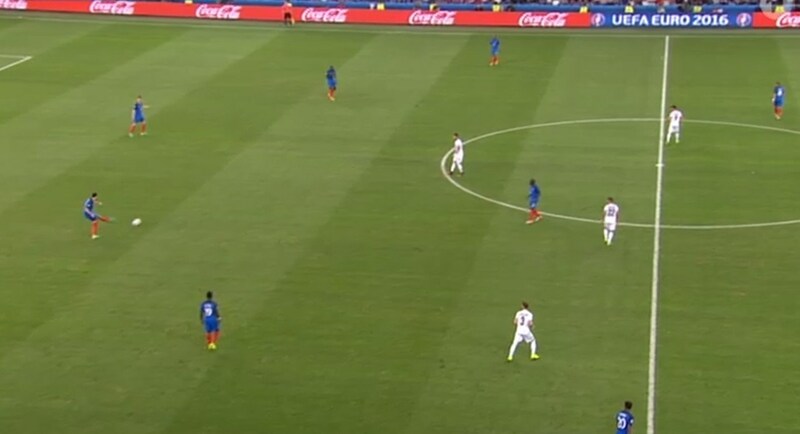 As if this were not enough, however, players like Coman and Martial often oriented towards the ball. It ended in strange situations in which nearly ten blue players faced ten white players. Instead of these movements to the ball and away from their opponents, the reverse would have been necessary in order to really build up pressure on the opponent in possession. Admittedly, this is already a very crass scene but shows perfectly the problem of the French in the first half. 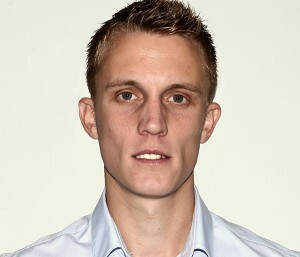 Five to six players are available to overplay one striker. Logically four offensive Frenchmen remain against nine players of Albania (at least very roughly). For comparison: In the game against the Czech Republic Spain designed its build-up adapted to the formation of the opponent. Two players (among others Pique in possession) are at the level of the opposing striker and can open or dribble within half space (half space = between the center and the wing). Only one player remains behind the ball, to secure the attack or as a passing option. Other problems France had with the unfamiliar man-orientation Albania’s. Actually quite easy to overcome, either lacked a good ratio in the playing space or simply the recognition and good use of open spaces. Example: In this scene Rami is in possession. Albania is based crass man oriented to the left. 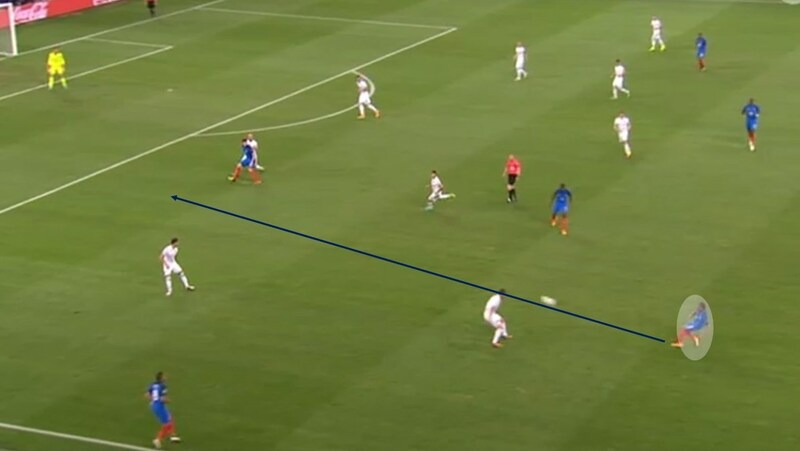 Although there are open spaces in the back, it cannot be used by French players because none of the players on the left sprint into that open space (or Giroud from the center). A simple chip ball would cause problems for Albania because of the speed of most players of the Equipe Tricolore. In all weaknesses that revealed France in the 1st half must not be embezzled that Albania could come up with good team tactical decisions situationally. 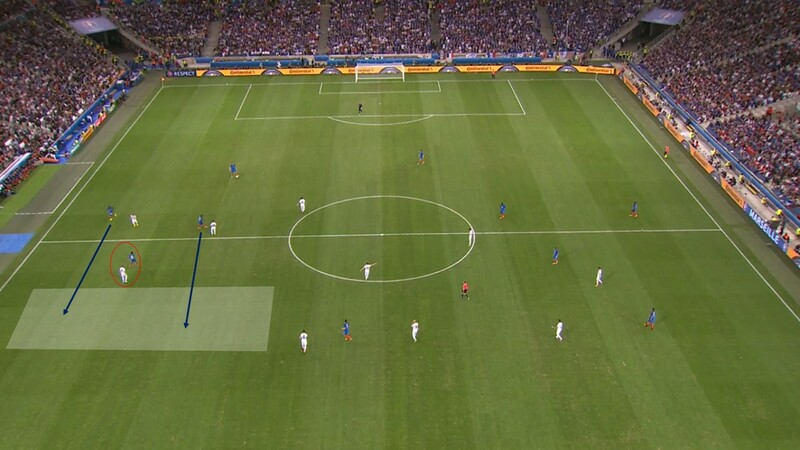 Example: Albania gets a good pressing situation to the left side, so France is forced to back pass. This back-pass is attacked aggressively. Ultimately France had to play a long ball – Albania gets possession. Overall, Albania positioned in a tight organization but too deep to really be dangerous on counterattacks. Because we must not forget that a massive defensive organization in which (almost) every duel is secured also has a downside – the way to the opposing goal is much longer. Example: The ball is won in the defensive line and once passed short (to the circled players). There is even at this time only one player clearly ahead of the ball, which must play against two remaining center backs – a hopeless situation. In the second half the game changed gradually. France recognized and used spaces much more common and shifted their players no longer from front to back, but from back to front. Especially against low block opponents (especially if they play with a striker), it is recommended to get the ball in possession in the half space behind the striker rather than on the wing. This gives the player more options and increases the pressure on the opposing organization (a solution that we could see already in the first German game). Example 1: Evra (not on the outside line, but in the half-space) gets the ball after a short cross. 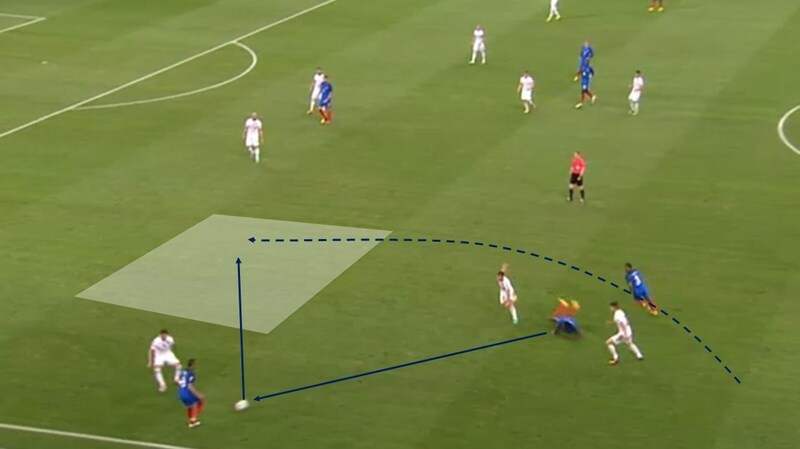 Because of the many options in this position, an Albanian player must start and put pressure on Evra. Because it is Evra and no midfielder, more players in front of the ball are available. 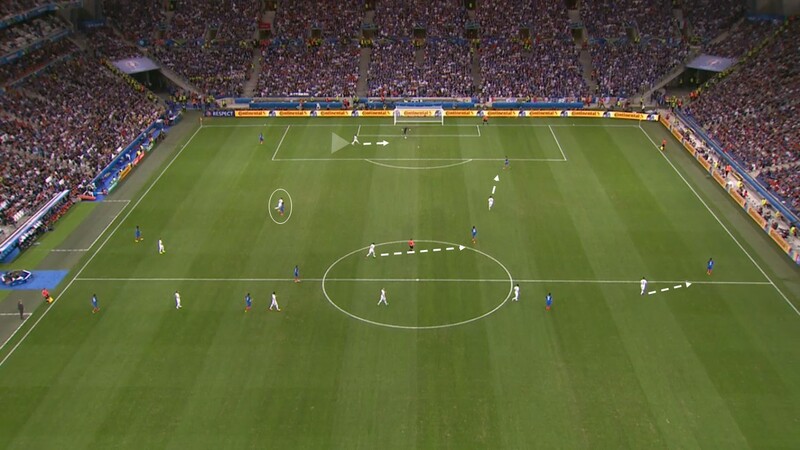 In addition, France created a 4 v 4 situation – a situation France could not create all 1st half. The result is a pass to the baseline (by the way: great play by Giroud blocking the defender) ending in a great chance of finishing in the penalty area. Example 2: The man-orientation gets Albania in more and more trouble. Again Evra has the ball in the left half space, makes a short pass to a midfielder (not pictured). The ball goes to the wing and Evra recognizes the opening space and runs immediately. Again, the result is a cross followed by chance by Giroud. That, and the presence of Pogba, who is able to maintain the ball against anyone, made sure that France was the much better team and created goal scenes almost every minute. The goals were a matter of time and came right on time. 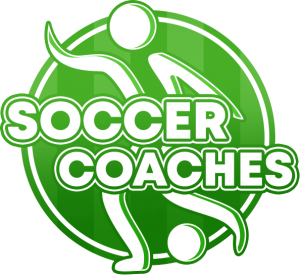 Find out more about the soccer coach Steven Turek – get information about coaching courses and much more! Click HERE ! Follow Steven and Soccer Coaches on Facebook and never miss an analysis!